Apple users: Did you know that you can’t buy Kindle books from the Kindle app on your iOS device? In fact, you can’t purchase them from the Amazon app either. Even if you’re an Amazon Prime member and you want to download a free book. Nah, not possible. This may not be news to you if you’ve tried to buy Kindle books from either application over the last 6+ years, but this recently came up again as an obstacle to a few family members and friends, so we thought it was still worth sharing the workaround. Granted, we can file this one under better late than never, but coverage seems warranted considering the fact that the issue has persisted for so long and isn’t looking to be resolved in the immediate future. The matter dates all the way back to an App Store policy update in early 2011, a time when the late Steve Jobs was still CEO and the company’s App Store was only a few years old. The App Store was introduced in July 2008 with the release of “iPhone OS 2.0”. Apple has been criticized from day one over the rules governing its App Store, which enforces various content restrictions and manual reviews of software submitted to the marketplace, in addition to (and more controversially) taking a 30% cut of revenue from apps sold through the Store. In February 2011, the company announced something of an expansion to that policy along with introducing a new subscription service that gave iOS users a centralized location to manage subscriptions for content-based apps such as newspapers, magazines, music and videos. The new service essentially gave iOS users a one-stop-shop for subscriptions, and in exchange for greasing the skids and processing the payments, Apple wrote itself in for a 30% share of revenue from digital content sold over iOS devices. Being forced to price-match in-app sales while paying Apple’s 30% commission proved challenging for many businesses. Compounding the bad news, the same press release announced that apps would no longer be able to provide links bringing users outside of apps for transactions, which previously helped developers sidestep Apple’s policy and its tax. The updated policy had anti-competitive leanings to say the least, essentially forcing rival distributors of music, ebooks and so on to compete with Apple on pricing for digital goods while simultaneously having to pay Apple a 30% royalty on those sales. Kindle app on an iPad. should be available as a free download to a Prime member. Browsing the Kindle app from an Android phone (below). 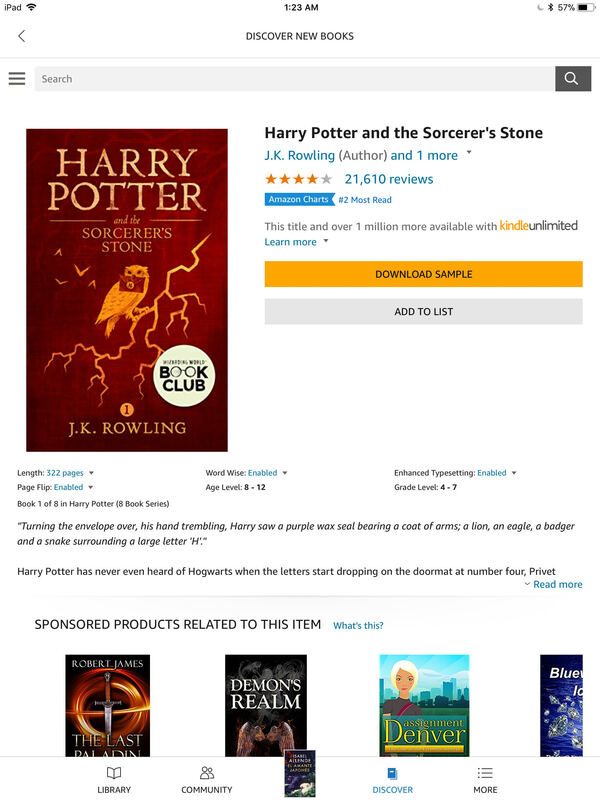 Prime members can read for free and also get the option to buy. Within a month, Apple eased its new policy by allowing developers to price their wares differently on the App Store, though given the 30% commission and ban on external links, this change didn’t improve circumstances for many companies and products. Such has been the case all these years for Amazon’s Kindle books, which again, can’t be purchased through either the Kindle or Amazon apps on iOS, even if you have Amazon Prime, and even if it lets you download a sample, from which you still won’t be able to buy the book. The workaround? Use Safari or Chrome mobile web browser and use Amazon.com to complete your purchase. Then go back to the app. While companies cannot provide external links to direct sales within apps, you can manually navigate to external sales with a web browser. That’s precisely what you’ll have to do to purchase Kindle ebooks (or download free books) on your iPhone or iPad. After buying them in a browser, they’ll be synced to your account and then you can access them inside the Kindle app. Apple’s now 7 year old policy emphasizes profit over functionality, but given the closed ecosystem’s level of success, it’s not surprising this remains an issue all these years later.